Are Above Ground Pools Sturdy? Posted on March 29, 2019 March 25, 2019 , in Above Ground Pools. For those considering investing in a new swimming pool, their longevity often becomes part of the equation. When asked the question of, “Are above ground pools sturdy?” the answer really comes down to many different factors. In this article, we’ll go over these factors to help you determine how long a certain type of pool might last. The two main types of materials used for the main components of swimming pools are steel and aluminum. Which material is the best really depends on who you’re talking to and what kind of pool set up they’re trying to sell you. Although aluminum won’t rust like steel, it will still deteriorate over time and eventually fail. You’ll pay a premium for aluminum and depending on who you ask, it may or may not be worth it. There are actually two types of aluminum pools – regular and extruded. Extruded aluminum pools have thicker walls that are stronger and longer lasting. Walls made of extruded aluminum come in sections rather than a single piece like those made of regular aluminum. An extruded aluminum wall will be much more stable, especially when there’s no water in the pool. Steel pools are typically cheaper than those made of aluminum, but they are also susceptible to rust. This becomes even more pronounced if you’re using a saltwater system. You should keep an eye on these types of pools, especially in the areas around the skimmer and the water entry point as their edges will be more prone to rusting. 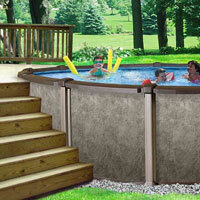 You can also find many pools that use a combination of both metal and aluminum parts. Typically, aluminum will be used on the more visible pieces whereas steel will be used for the walls and tracks. You may have heard about resin pools, but usually the resin is just used in certain components like the tracks, top rails or connectors. Even pools that are called all-resin will likely have walls made of steel or aluminum. The actual frame of your above ground swimming pool will most likely outlast your pool liner several times over. Although many pool liners come with decades-long warranties, the fact is that you’ll likely have to replace it every five to 10 years. If you diligently maintain the rest of your above ground pool components, you’ll likely replace your liner two to four times before you have to worry about the frame. Whether you buy an aluminum or steel frame, your above ground pool will easily last a couple of decades with some general maintenance. Aluminum may be sturdier, but you will pay more. For the sturdiest material of all, you might want to invest in extruded aluminum. The part of your pool that will have the shortest lifespan is the vinyl liner – expect to replace it at least a few times before anything else. Now that you know about how sturdy above ground pools can be, download a brochure to learn more about our models.